If you search the Internet, you can find several different explanations of how the town of Happy Camp got its name. The most common explanation is that it was named by gold miners during the mid 1800’s because the location was central to all of the incredible gold finds that were being made up and down the Klamath River, Elk and Indian Creeks. One story tells of a group in 1851 that followed the Klamath River from the coast and stumbled upon a rich deposit of gold at the mouth of Indian Creek. There is a long stretch of flat land alongside the river below Indian Creek where the original camp was set up. Later flood storms eventually forced the miners to move to higher ground. We found rich, streambed under where Happy Camp was founded! We have been aware of this very rich surface deposit for quite some time. I believe it may have originally been discovered by Rip Ripple, a longtime New 49’er, who shared his discovery with dozens and dozens of new members. Rip recovered a lot of gold in that place, along with some very nice nuggets. 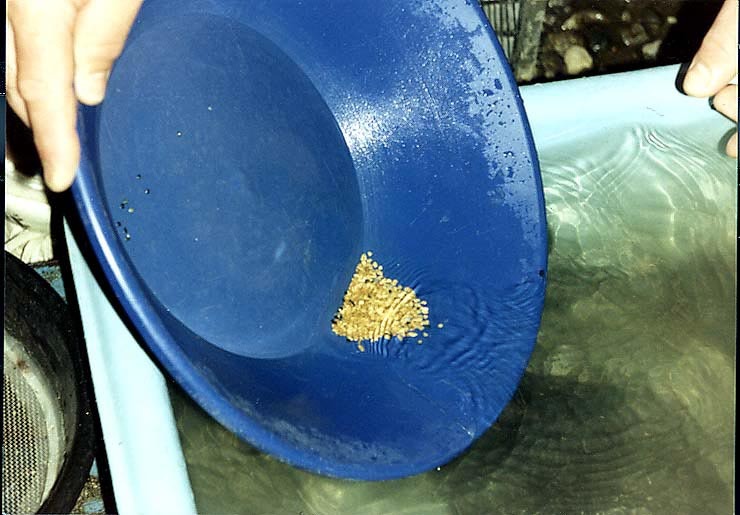 The reason we have kind of kept things quiet is that the location is so close to our office in Happy Camp, it is a wonderful place to bring beginning gold prospectors and show them how to pan for gold – and make sure they are going to find some, too! Sometimes beginners find nice nuggets. The scenery is spectacular! Sandy Jones is my loyal and hard-working mining partner these days. She is a very good and experienced miner on her own, so I feel very blessed to have her at my side. We devoted most of this past season digging out exposed cracks in a long stretch of bedrock on the far side of the river on K-23AA. This is a relatively new New 49’er gold property that has been making a lot of members happy. We were recovering decent gold, especially considering that we were not using motorized pumps. Using kayaks to cross the river, the digging was easy and the golden flakes of pure wealth were getting larger and more plentiful. As good as that was, the peacefulness on that remote part of the river allowed us to enjoy the beauty of being outdoors in an area that is so beautiful that we can’t help but feel calm, relaxed and blessed for what we have been given. As the summer months were winding down, we knew we needed to move somewhere else; because we didn’t want to cross the river during the winter time when the river runs higher, faster and colder. 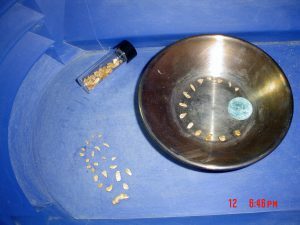 Sandy had been telling me that she knew of a place where our digging would turn up nice gold nuggets. I admit that I just kind of waved it off, because I hear these kinds of stories all the time. But Sandy is serious about her gold mining; she’s not one to joke about gold! So we went to this place just downriver from Happy Camp where we often send beginners. This was a very easy place to get to, and that’s the reason Sandy knew about it. Before becoming my partner, Sandy was married to a very nice guy named Cliff. Cliff was a big supporter of The New 49’ers, and he loved to mine. But he had serious disabilities and health issues which required him to prospect in areas that were easy to get into. Before he passed on (almost until his last day), Sandy and Cliff devoted several years digging gold in this place. This was why Sandy knew so much about it. She took me down there and said, “All you have to do is dig and you will get beautiful nuggets!” This was a bit difficult to fathom being that the location was so accessible and right on the outskirts of Happy Camp. I’ll bet hundreds or thousands of miners have walked right over top of this area since the original gold rush and figured the place had long since been mined out! So we dug. Just like Sandy said, after going through some loose flood sand, we found hard-packed streambed material that had never been mined. What a bonanza! Processing material in the back yard! This ancient hard-packed material is tough to dig. It’s probably thousands of years old. 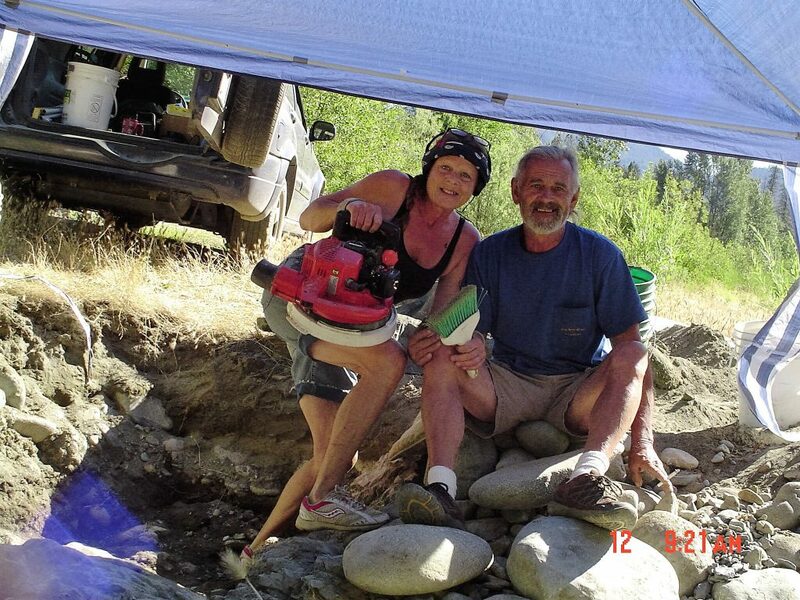 Shortly after getting started, determination and persistence finally paid off as we uncovered bedrock about 18 inches into the material and Sandy, all smiles, yelled out, “John come look!” She had uncovered a nugget on the bedrock and wanted to show me. My luck at finding nuggets had been nill up to that point. Both of us were excited and continued digging with new interest when she yelled out again and then again and again. I didn’t get much digging done as she kept saying “John look!” How do you not go over and look when your partner is uncovering buried gold treasure? Man; were we jacked up! We finally quit that day only because it got dark and I couldn’t see anymore. Sandy had picked up 10 beautiful nuggets off the bedrock. We brought our buckets of pay-dirt home and ran it across the high-banker. I yelled out, “Look Look,” as more beautiful nuggets appeared in the high-banker. By the time we were through, we had 24 nuggets for just that day. Man; that’s an all-time record for me! We were so excited, we almost skipped dinner! Here is what ancient streambed looks like! More Group Projects and Activities this Coming Season! 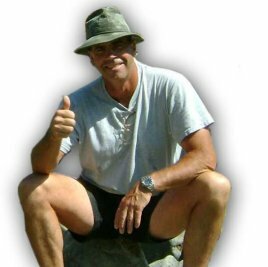 For starters, electronic prospecting specialist and New 49’er member, Dennis Dickson, has offered to host two 2-day electronic gold prospecting projects in Happy Camp this coming season. The first day will be dedicated to theory and demonstration. The second day will be real prospecting for gold nuggets in the field. 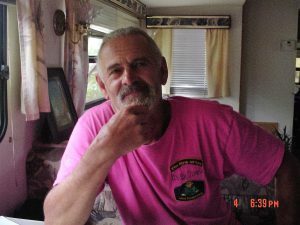 I have spent time with Dennis, and there is not anything he doesn’t know about every make and model of metal detector for the purpose of finding gold. He is particularly skilled with pulse detectors. Whites Electronics contracts with Dennis to go all over the world and provide training to their dealers. These very valuable 2-day projects are free to all New 49’er members. Bring your own detectors. The projects are scheduled as follows: Friday & Saturday June 9 and 10 and Friday & Saturday August 18 and 19. We will meet at our Headquarters in Happy Camp at 9 am. In addition, my loyal team of local supporters and I are working on a plan to add a non-motorized underwater suction device to our scheduled weekend projects. 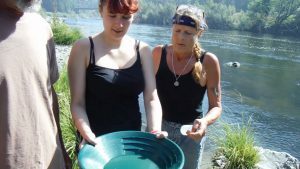 As long as it works out, participants will have the option of either mining gold on the surface (out of the water), and/or taking turns sucking gravel from the bottom of the river. 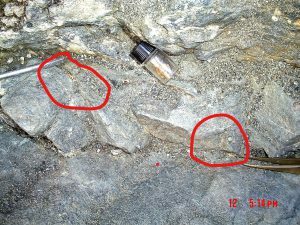 We have already located a high-grade gold deposit in the location where we hope to operate this device. Therefore, I am predicting the volume of gold we will recover on our weekend projects should increase dramatically. Our weekend surface mining projects for 2017 will be on the following dates: June 3 & 4; June 24 & 25; July 15 & 16; August 5 & 6; August 26 & 27. These are free to all members. Once we have this system in place, and all systems are go, we will schedule single-day underwater mining projects for a limited number of members, each of us taking turns with 2 people down at a time, to recover as much gold as we can. As long as it works out, these single-day projects will be free to all New 49’er members and each participant will get an equal share of the gold. No prior experience is necessary. The location we have in mind is in shallow water; a perfect place for beginners to learn. Participants will need to provide your own basic diving gear. 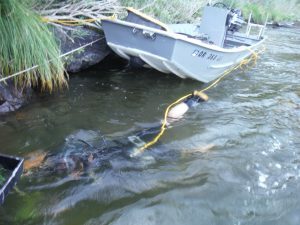 Wet-suits won’t be required for most of the season, because the Klamath River is so warm during the summer months. At the moment, we are considering devoting one day per week to these underwater mining projects. Watch for more scheduling details once we get the system dialed in. This won’t happen until the wet season ends in the spring. Due to strong demand, John Rose has pulled a team of our most experienced members together to provide single-day guided prospecting adventures to as many as 4 members at a time. 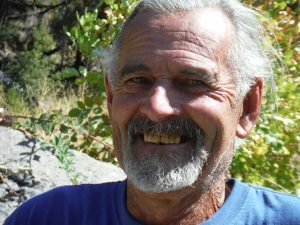 There’s nothing better than teaming up with the most experienced gold prospectors on the Klamath River! Sandy Jones showing Nicole how to pan for gold. Dickey Melton is part of the team! 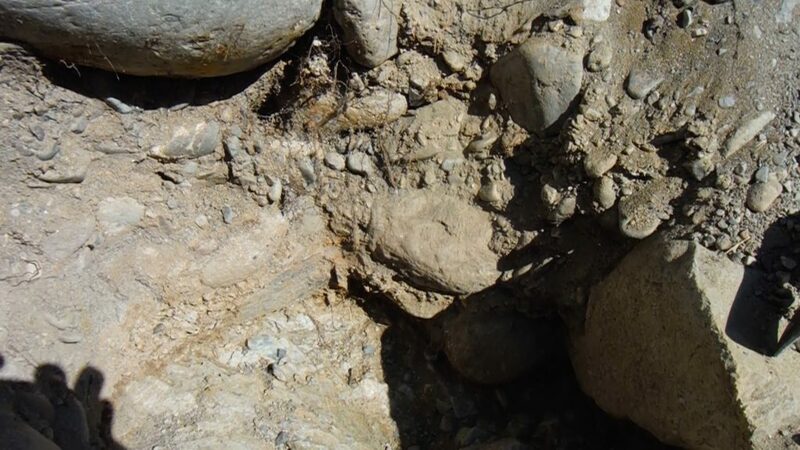 Take your pick: John’s team includes experts in prospecting for high-grade gold, gold panning, hand sluicing, and crevicing both above and below the water, electronic prospecting, and processing your final gold clean-ups. Keep all the gold you find! Each participant must be a member of The New 49’ers (special discount of $50 for Associate Membership if you sign up on line). Adventure cost: $100 per person or $150 per couple. 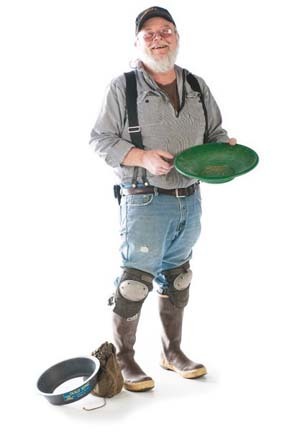 Participants must supply your own digging & panning gear and arrange for your own food & lodging. These are all available in Happy Camp (northern California). As New 49’er members, you will be able to continue mining gold from the deposits that you help locate on these adventures. It Appears as Though the Momentum of our Enemies is about to be Trumped! It’s only a few weeks since we won perhaps America’s most historical and important election of all time. I personally am slowly recovering from shock that we may actually have a real chance at placing America back on track again with the values which made us great in the first place. Based upon his actions, the appointments he has made so far, and his speeches over the last few days, Mr. Trump looks to be the real deal! Nothing is for sure in this ever-changing world of ours; but the election of Mr. Trump as President does appear to present a bright light at the end of the tunnel for our industry. While we will continue to defend small-scale miners at the local level, all of our hard work over the past decade has placed the very important Rinehart case as primed for an appeal to the US Supreme Court. The New 49’ers Legal Fund, along with other industry associations, fully intend to support the efforts to urge the high court to review the case. We strongly believe, as did the Third Appellate Court of California, that federal law is in favor of our position. According to public statements put out by the emerging Trump Administration over the last few days, one of Mr. Trump’s first priorities when he takes over in mid-January is to appoint a strongly-conservative judge to fill the existing vacancy on the U.S. Supreme Court. I am only predicting; but my best guess, since the republicans have kept control over the senate, is that they will already work out who will be appointed even before Mr. Trump takes office. Therefore, it is reasonable to predict that the U.S. Supreme Court will recover a conservative majority soon into the New Year. Because of that, I personally believe we will win the Rinehart case in the high court if we can get them to review it. Winning that case will, more or less, return our industry back in a better place than it was before all the unreasonable prohibitions in both California and Oregon began so many years ago. There is also the possibility of coming up with a new federal law that provides incentives and protections for small-scale mining in America. Our main task now will be to encourage the high Court to review the case. Once we file the appeal, and the new administration gets itself plugged in, we will want to push as hard as we can. Just to show how the winds of change are moving, here is the first positive press I have ever seen for small-scale miners out of the Sacramento Bee! But we shouldn’t let our guards down. My perception at the moment is that dark forces of the left are busy mounting a mammoth opposition to Mr. Trump’s aspirations to free America from too much government control, wasteful spending, absurd regulations and the socialized policies which have all but destroyed the American Dream. He will need our visual and vocal support when he starts making the real important policy changes. I predict the leftists will be screaming like murder! Mr. Trump is telling the truth when he accuses the press of being deliberately dishonest. In fact, hiding behind the First Amendment, the press has largely become a very organized propaganda machine, mostly in support of leftist policies. Somehow, America is going to have to overcome this. Because it is the press which puts out the information which everyday Americans digest in order to form our opinions. I would remind you that it is the grossly flawed report authored by Charles Alpers of the U.S, Geological Survey that western States are using to justify their moratoriums on motorized mining. My team was contracted to perform the excavation work on Mr. Alper’s study on mercury. So we are intimately familiar with the details. California’s Water Board officials were also present and are aware that Mr. Alper’s report is a total fraud. These people should be in jail! The point here is that Mr. Trump’s team is going to need to dig very deep to find and remove the left-agenda poison inside our public institutions that has made America less than great. Action Alert: As to our situation, we should start pushing for Donald Trump’s help right now. He has put up a web site asking for our input on what needs to be changed to help America become great again. We have put up an “Action Alert” page which provides the web site address and some sample language you can make use of to provide Mr. Trump with your own message. It will only take a few minutes of your time. Our sample language provides a link to a letter which our attorney, James Buchal, wrote to Mr. Trump on 17 November. The letter goes a long way to explain what we have been up against. I suggest the most likely chance of winning our industry back is through assistance that could be provided by the new Trump administration. The more of us he hears from, the more likely we will be put further up on his priority list. Thanks in advance for all that you guys do to support our efforts! Giving Away Gold & Silver American Eagles! 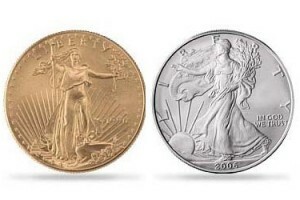 In anticipation of continued legal challenges ahead, The New 49’ers Legal Fund has begun a new fund-raiser with 3 ounces of gold American Eagles and 10 ounces of silver American Eagles (25 prizes in all). Our Happy Camp headquarters is open between 9 a.m. to 4 p.m. Monday through Friday, except for national holidays. If you call the office while we are closed, please leave a voice message and we will get back to you. Thanks for your understanding.